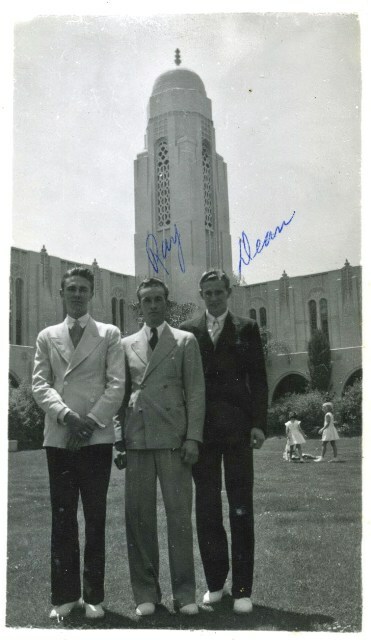 Wilshire Ward, L.A. Dean, Ray and Ken. May 8, 1938. Ken just brought us down to San Pedro about fifteen minutes ago. Our ship is in the dock taking on more cargo. They expect to sail sometime this evening. I'm surely nervous or something... you can tell by my jerky hand writing. We have been assigned a cabin between us. I on the upper berth and Ray on the lower. (That's our beds.) We have our trunks and things in our cabin. The ship is quite large. Of course I haven't any idea how many tons or how long, etc. I'll find that out later. The decks are quite dirty and all, but our cabins, "smoking" room, dining-rooms all look clean enough. Aunt Em couldn't get away today. She wanted very badly to come down and see us off. Ken had to rush right back to his job in the stand so we are alone now. They surely treated us swell. We went to the Redondo Beach yesterday afternoon after attending Church services at the swell Wilshire Ward. At the pier we watched the fellows fish. One guy pulled out a "shovel-nosed" shark while we were watching. That was the only catch we saw made. It weighed about 20 lbs and took fifteen minutes to land. I took a picture of it. 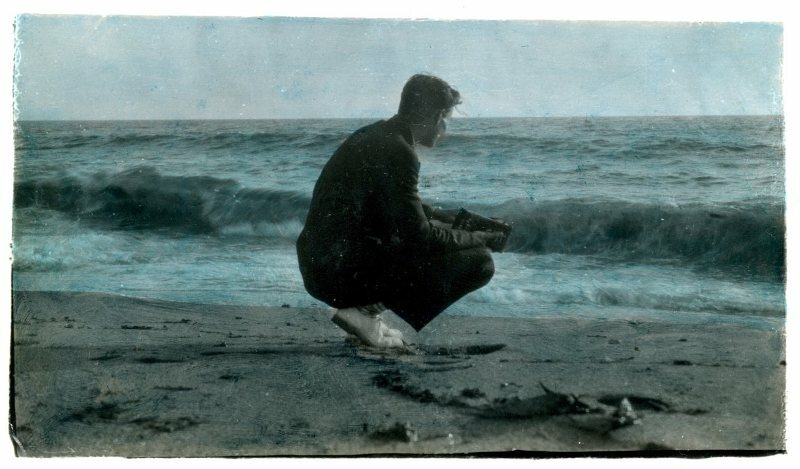 All the pictures I have taken haven't been developed yet. As soon as they are, I'll send you some. Saturday nite Aunt Em & Song took us to Observatory (Griffith's). There we were allowed to look a the moon through a gigantic telescope. From a smaller one, we looked all over town. That was a beautiful sight if ever I saw one. We could see L.A., Hollywood, Redondo, Ocean Park, Venice, Santa Monica, etc. with all the lights turned on. If you have ever seen it, you know how pretty it is. As I said, they surely treated us swell. Well, it won't be long now before we leave old U.S. We are still anxious to get going. It seems as though we have been gone a long time though, even if it hasn't been quite a week. Mom, have a picture of Grandma & Grandpa printed from that negative and send it to Ken. He wanted mine but I wouldn't part with it. Well,... that was a very nice lunch. We had soup, steak, mashed potatoes and gravy, and for dessert ground rice pudding. Not half bad. Our crew here is a bunch of Englishmen. Everywhere we go they greet us with Sir. Makes a guy feel funny. "His Magesty's Ship"... 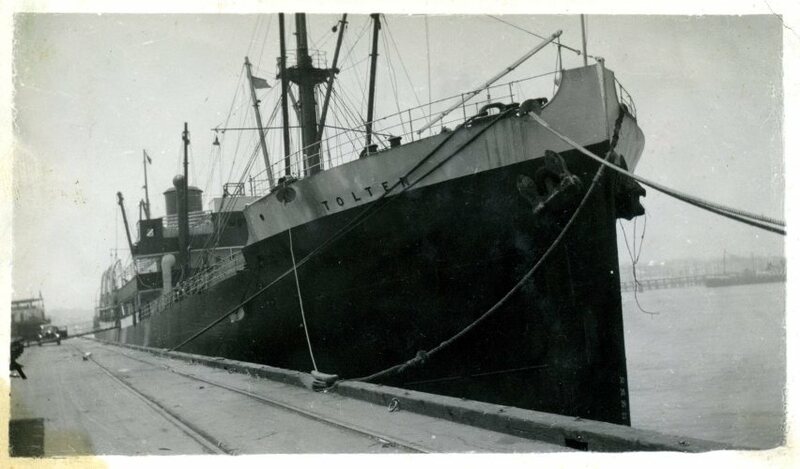 Freighter, M.V. Tolten 5,348 Tons. Well, I'll let that do for this time. I'll be writing again when we reach high seas.